New Video!! Just in time for Easter I have the most beautiful vegan and gluten-free dessert/brunch treat for you. 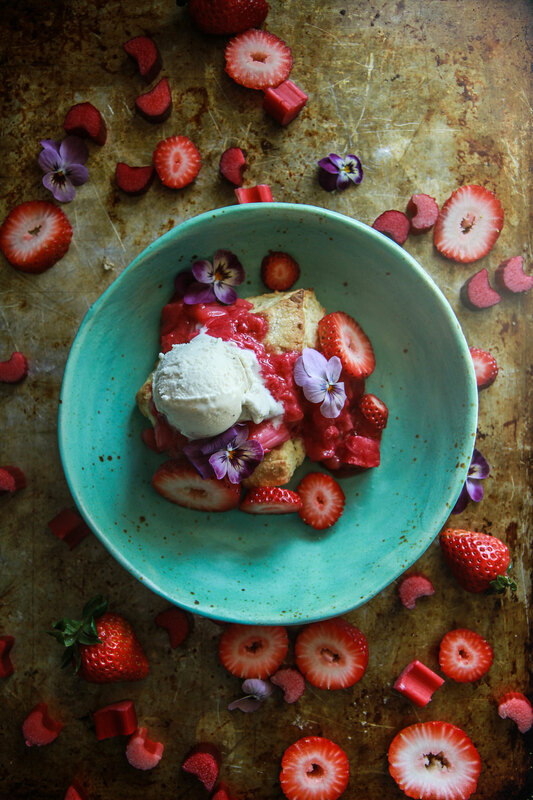 Strawberry and Rhubarb is one of my very favorite Spring flavor combos and I think you will love these versatile shortcakes which are as good for dessert as they are for brunch! Strawberries are so nostalgic to me- when I was growing up in the early 80’s, my mom had the most amazing garden. She basically ripped out our entire yard and planted a huge self-sustaining garden that she would work in all summer. My siblings and I would have all kinds of jobs out there (most of them were obviously lame, like weeding) but my favorite was picking the strawberries! Obviously. Now that I have my own yard and I am a gardener, (ha! or I try to be. I’m pretty mediocre, but attempt to compensate with passion!) I find it very soothing to work in the yard when I have time and it’s one of my favorite things to plant a garden every year. I tend to gravitate towards fruit and vegetables, and without fail make sure my herb garden is on point each spring! Because of all of my childhood memories, I planted an obnoxious amount of strawberries in our garden so that my daughters could have that experience as well! Then there is rhubarb, which grows like a weed in the Pacific Northwest and is so under used. For me strawberry and rhubarb is one of those magical flavor combinations, and always a sign that Spring is here. 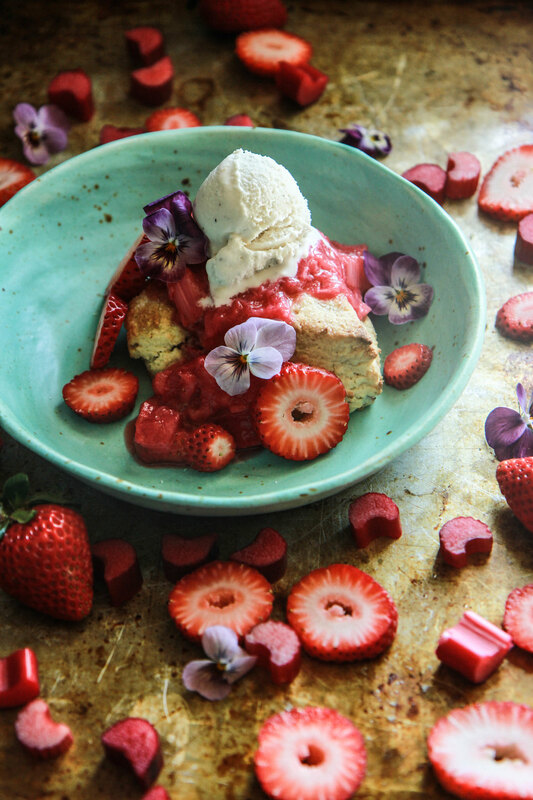 Sweet strawberries and the tartness of rhubarb is amazing together! I love to cook them together into a chunky sauce with just a little sugar to bring out all of their natural flavors. This is good as a jam stand-in, a topping for pretty much any dessert and if you cut out the sugar and added onions, you would have a stellar chutney for savory dishes too. Basically it’s an incredibly versatile flavor profile suitable to a ton of different dishes. But don’t let me forget about the shortcakes!! They easily double as a breakfast scone which you can have with jam, or you can top it with vegan ice cream, fresh whipped coconut cream and tons of this delicious strawberry rhubarb sauce and have a fresh dessert spin on Old-fashioned Strawberry Shortcake. Pre-heat the oven to 400 degrees and prepare a sheet pan with parchment or a silpat. In a small bowl, combine the unsweetened coconut milk and the apple cider vinegar and set aside. In the bowl of a food processor combine all of the dry ingredients and pulse to combine. Pulse in the vegan butter until it is well combined into the dry ingredients. Stream in the coconut milk/apple cider vinegar while running the food processor and pulse it until the dough comes together into a ball. Transfer the dough to your work surface, sprinkle in the chopped rhubarb and shape into a disc. Use a sharp knife and gently cut the disc into 6 wedges and transfer them to your prepared sheet-pan. Sprinkle the tops of the scones with the 2 teaspoons of sugar. Bake the scones for 12-14 minutes until golden. Let them cool slightly before serving. While the scones are baking, make the sauce. In a medium saucepan combine the strawberries, rhubarb, sugar and water. Bring to a simmer over medium heat and simmer until all of the sugar has dissolved, the fruit has broken down and the sauce has slightly thickened, about 5 minutes. Pull of the heat and serve with shortcakes hot, chilled or at room temperature. 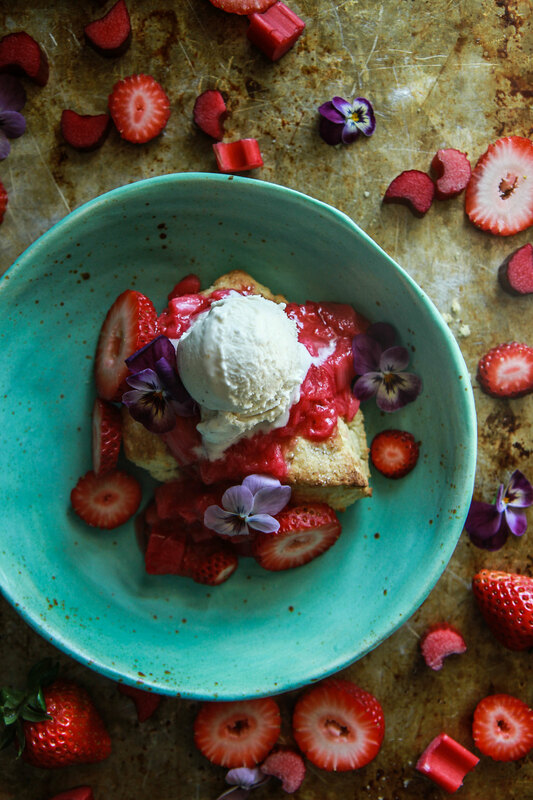 To assemble the shortcakes, top a scone with a big scoop of vegan vanilla ice cream (or whipped coconut cream) and lots of Strawberry Rhubarb Sauce! Can’t go wrong with strawberries and rhubarb for Spring! Love the side of sauce for dipping. Such a fun idea! These look so awesome and ready for summer! !